Google redirect virus is a term used to describe an unwanted browser redirect tendency which is implemented by using the browser hijacker. 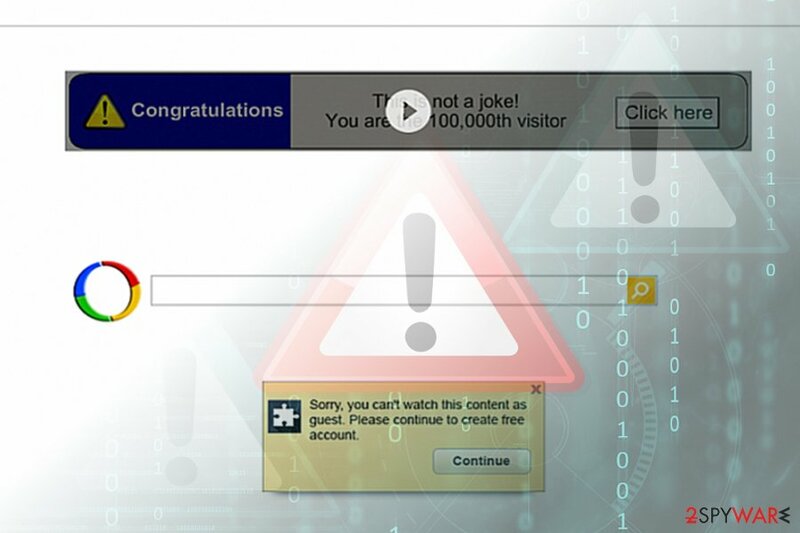 Find this browser redirect virus and eliminate its damage by running a full system scan. This is the easiest way to identify malware hiding under harmless name. Google Redirect is a term used to describe a variety of infections that affect Google Chrome browser. Google redirect virus is a term used to describe browser hijackers, adware and other potentially unwanted programs that display intrusive advertisements, change the homepage, alter search results on Chrome web browser. As evident, these infections have nothing to do with Google and are created by third-parties that seek to monetize on ad revenue. In the meantime, users' web browsing experience suffers, as they struggle to find relevant information, battle the annoying pop-ups and have to deal with the slow operation of the browser. On the other hand, Google itself has received enough criticism for spying on its users, bypassing phishing links among its search results and allowing malicious apps into Google Play Store. Despite that, the industry giant is trying to reduce the malware inside its own store by tightening its security, improving scanners that block malicious URLs and providing users with plenty of information on how site admins can protect their visitors from malware. Symptoms Symptoms vary depending on type of infection; however, users will notice strange behavior on Google Chrome, such as frequent redirects to suspicious sites, pop-up ads, alternative search results, changed startup page and new tab URL, etc. Risk factors Malware infection, money loss, sensitive information disclosure to unknown parties, etc. The majority of complaints, reporting URL redirects on Google page and similar search engines, was recorded in 2012. However, the threat is still viable as it surfaces once in a while. Both Windows 10, Linux and Mac OS users can be victimized. Note that Google redirect virus iPhone and Android versions also exist. Alternatively, this virus is known as Chrome redirect virus. There is no wonder why Google redirect virus is so active this year. 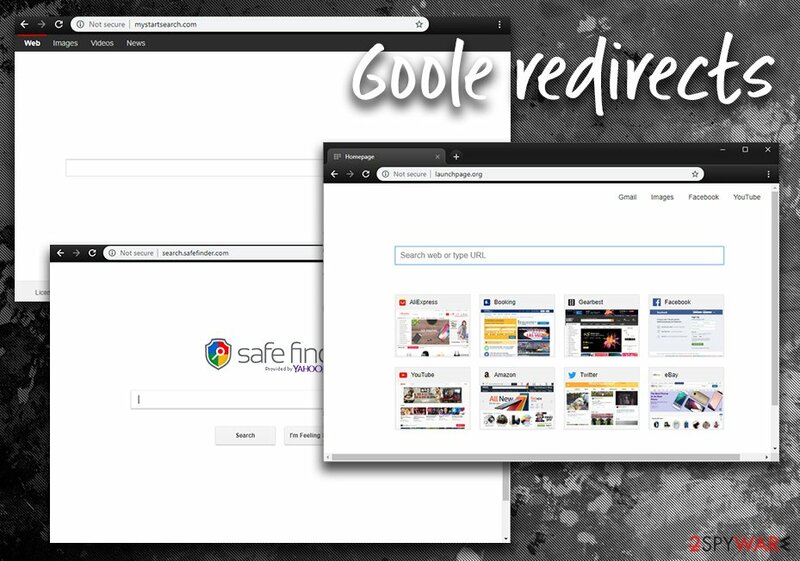 Browser hijackers causing redirects typically target Google Chrome user because it is the most popular web browser in the world. Clearly, it means that attacking users of this browser means hitting the right spot with the biggest number of potential victims. Some experts tend to shorten the term and simply call the infection as Google virus. However, we want to clarify the meaning of it. Google virus is a potentially unwanted program (usually a browser hijacker) that meddles with browser's settings and worsens user's browsing and search experience. Typically, such programs are designed to collect victim's search terms and browsing history data and contaminate regular search results with ads. In case you have been noticed that Google redirects you to Yahoo or other domains (these sites can be either well-known ones or totally new to you), you should take necessary measures to solve the problem. Just like Yahoo Redirect virus and Bing redirect virus, Safari redirect virus, it functions as a hybrid of a browser hijacker and a potentially unwanted program. The main problem here is its elimination – the infection can hide under any URL domain name, so it might troublesome to eradicate it manually. Reimage or Plumbytes Anti-MalwareMalwarebytes Malwarebytes speed up Google redirect virus removal process. They also save your time by wiping all web scripts and “helper elements.” It is of utmost importance to “uninstall” them all in order not to experience this issue again. Some users start wondering if they're infected with some Google virus after experiencing “Google bookmarks redirecting” issue. If your browser unexpectedly initiates a redirect loop once you attempt to open your bookmarks, do not worry. This issue is common and can be fixed quite easily. Usually, all that it takes to fix the problem is to clear browser cache, cookies, and history, or to sign out of your Google account, close the browser and sign in again. It seems that the problem with this domain has been bothering both Windows and Mac users for years. 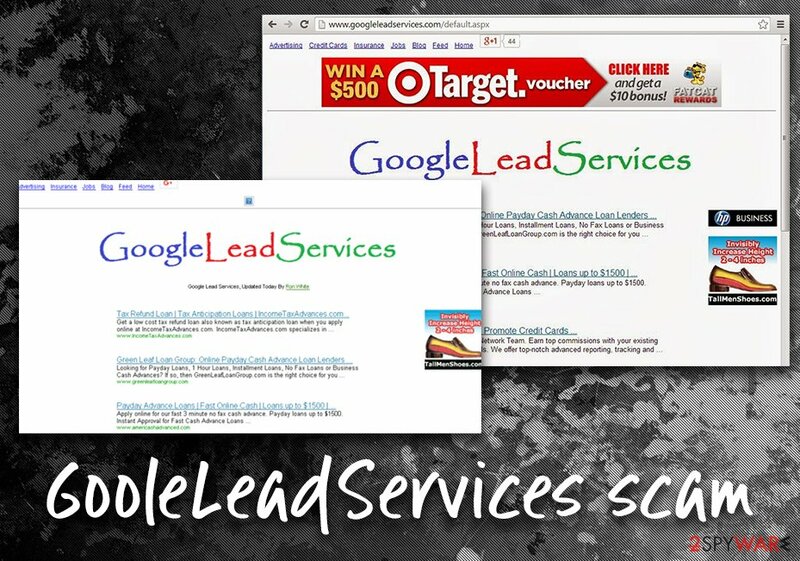 Some people complain about Google Lead Services Cookie that prevents smooth navigation in Safari and other browsers. If you have run into this domain during your browsing session, we highly suggest scanning your computer and removing all files and components associated with it. In case you experience continuous redirects to the described domain, check if your browser's shortcuts aren't affected. You can find a comprehensive tutorial on how to do it right below the article. “Is Google redirect virus dangerous”? This is one of the questions curious users might ask. Though technically, it is not as complex as Petna or Cerber malware, its consequences might be as annoying as those caused by these ransomware-type threats. Altered browser and system settings. Typically, this virus changes the default search engine, new tab, and the homepage. It might also append extra extensions. Foisted commercial content in the search results. If Google search engine is changed to some fishy Ask or PlusNetwork tool, you might notice more commercial ads beside the search result. Tracking your online activities. More aggressive versions of browser redirect viruses might not only compile information about your frequently visited websites and search entries, but gather personal details, such as name, email, IP and home addresses, and trade this data with business partners. Such phenomena should not be ignored even if excessive advertising does not bother you. This issue has nothing to do with safe browsing and, even if you have a reputable malware elimination tool installed on your computer, remain vigilant while adding a new toolbar or a browser extension. Google redirect is a browser infection that has many forms of disguise. The easiest way to remove Google redirect virus is to scan the system with updated security software. Redirecting users to modified versions of Google, injecting ads and collecting victims' search terms helps companies make money by driving traffic to predetermined sites. Some of the authors of such redirect viruses join hands with online advertisers or specific third parties. By directing users to certain websites, they get a certain share of the profit from web traffic. As we have already mentioned, some of these sites can be entirely harmless (Yahoo, Bing, Facebook or Comcast), but it does not apply to all of them. Modified search results can contain links pointing straight to deceptive or malicious Internet sites you definitely do not want to enter. Be aware that the matter is extremely dangerous and can compromise your computer by stopping it from functioning normally, locking your files, stealing your credentials or other sensitive data, or even corrupting Windows operating system. At first glance, it may seem that installing a free application from trusted sources will exclude you from the burden of PUP and malware. However, few users realize that even recklessly installing the latest update of Skype or Java might lead them to install unwanted elements, such as adware, browser hijackers , as well. What you have to do when installing freeware and shareware is to monitor its installation process carefully. Choose “Custom” or “Advanced” installation method. It discloses optional download options. Remove the checkmarks from irrelevant add-ons and only then click on the “Install” button. Due to the flexible form, the malware might also function via web scripts. In that case, you might not spot any specific changes in the browser. Luckily, even then, there is a solution. Proceed to Google redirect removal section. 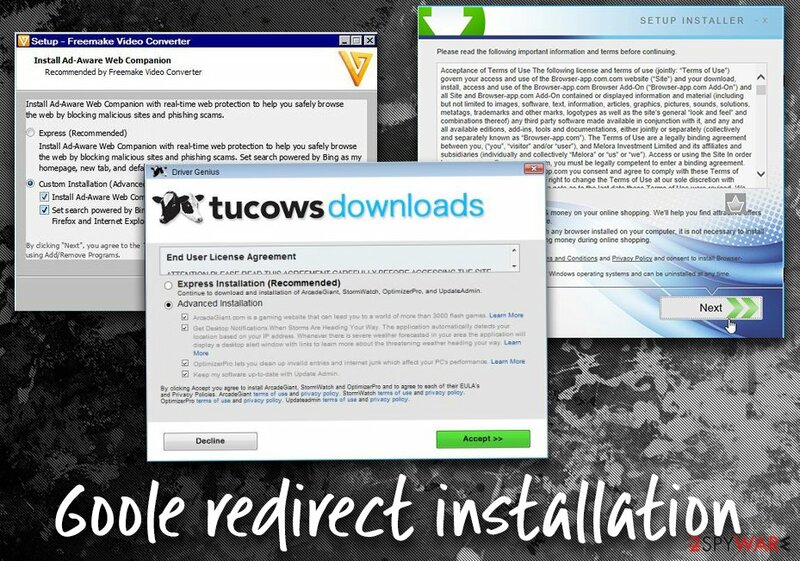 Run an anti-spyware tool to start Google redirect virus removal process. The software will also locate delete the registry keys associated with this threat. After scanning the system, you need to look over detected items and remove them all at once. With a help of anti-spyware program, this can be done in a single mouse click. 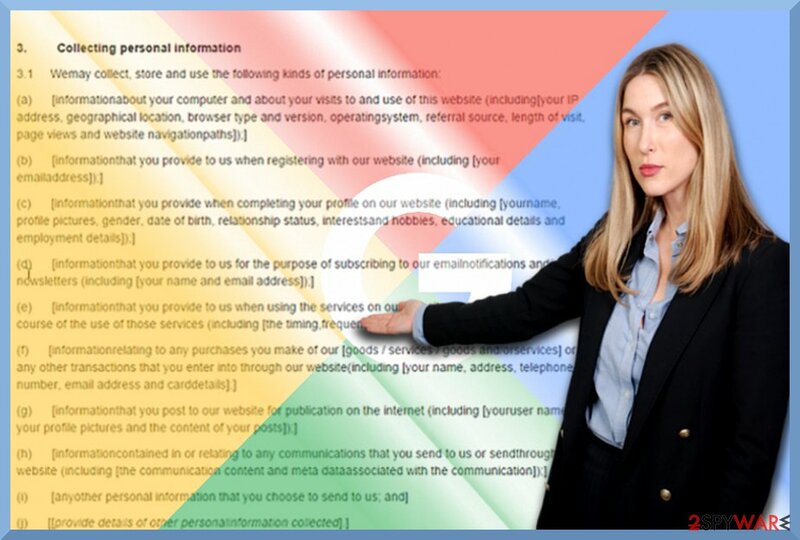 They instruct how to get rid of unwanted and dubious browser add-ons. Full browser reset also facilitates the removal process. If you are still bothered by the occasional redirects, change your proxy settings and host file. You can find the instructions specific for your browser on the Web. Now proceed to the below guidelines. Safari users will also find the Google redirect scam removal instructions for their browser. Though the infection is widely spread and operates already for several users, it might take the liking of users residing in a specific country, for instance, Germany. To get rid of Google redirect problem, you need to uninstall all programs/apps that seem suspicious. Also, you should definitely get rid of programs that you can't remember installing on your computer. Here, look for Google or any other recently installed suspicious programs. To fix your Mac OS X, you should try to find all entries that seem unknown to you. All apps that you can't remember installing on your computer should be eliminated. Wait until you see Applications folder and look for Google or any other suspicious programs on it. Now right click on every of such entries and select Move to Trash. When in the new window, check Delete personal settings and select Reset again to complete Google removal. Once these steps are finished, Google should be removed from your Microsoft Edge browser. Here, select Google and other questionable plugins. Click Remove to delete these entries. Now you will see Reset Firefox to its default state message with Reset Firefox button. Click this button for several times and complete Google removal. Here, select Google and other malicious plugins and select trash icon to delete these entries. Click Reset to confirm this action and complete Google removal. To remove Google virus from Safari, eliminate unwanted extensions and reset the browser. Here, select Extensions and look for Google or other suspicious entries. Click on the Uninstall button to get rid each of them. Here, look at the Homepage field. If it was altered by Google, remove unwanted link and enter the one that you want to use for your searches. Remember to include the "http://" before typing in the address of the page. Now you will see a detailed dialog window filled with reset options. All of those options are usually checked, but you can specify which of them you want to reset. Click the Reset button to complete Google removal process. ^ Margaret Rouse. Browser hijacker (browser hijacking). SearchSecurity. Information Security information, news and tips. ^ Alex Hern. Google will stop scanning content of personal emails. The Guardian. World and UK News. ^ Zack Whittaker. Google let scammers post a perfectly spoofed Amazon ad in its search results. ZDNet. Technology News, Analysis, Comments and Product Reviews for IT professsionals. ^ Andrew Orlowski. Google Play Store spews malware onto 9 million 'Droids. The Register. Sci/Tech News for the World. ^ Enhance phishing and malware protection. Google Support. G Suite Admin Hep. ^ How to remove the Google Redirect Virus? . 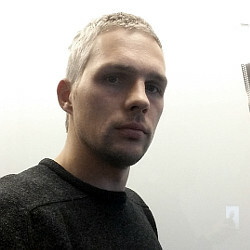 Microsoft Community blog. ^ Google search redirects to yahoo. Google Chrome Help forum. ^ Gabriel E. Hall. What are browser hijackers and how to remove them. 2spyware. Security news and virus removal guides. ^ How to eliminate computer malware. Dieviren. IT News, Reviews and Virus removal instructions. Какво представлява пренасочващият вирус Google? This entry was posted on 2019-04-16 at 04:45 and is filed under Browser Hijackers, Viruses. You can quickly scan the QR code with your mobile device and have Google redirect manual removal instructions right in your pocket. How did you remove Google redirect?